Jak and Poi is a two-player card game based on the way we have always wanted to play Rock, Paper, Scissors. High tech weapons, super heroes and monsters - these are some of the crazy and unique items that we wished were part of the Rock, Paper, Scissors gameplay. Jak and Poi turns this wish into reality and the rest is history. 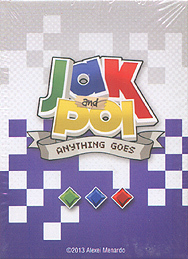 In Jak and Poi, "anything goes." Regular rock, paper and scissors cards can be pitted against each other or pitted against specialized, pumper up cards! No card idea in the game is too outrageous! In fact, all 60 card in this ALPHA deck have been specially designed by payers like you, who have an interest to creating awesome things.